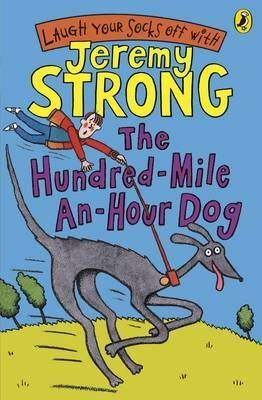 The Hundred-Mile-an-Hour Dog by Jeremy Strong has become a children's classic! From The Hundred-Mile-an-Hour Dog to karate princesses and hot cross bottoms, there's a Jeremy Strong story to suit every child's sense of humour. Jeremy's readers range from 7 to teen, perfect for fans of Roald Dahl and Morris Gleitzman. Streaker is a mixed-up kind of dog...with quite a bit of Ferrari and a large chunk of whirlwind. Streaker is no ordinary dog. She's a rocket on four legs with a woof attached, and Trevor has got until the end of the holidays to train her. If he fails, he'll lose his bet with horrible Charlie Smugg, and something very, very yucky involving frogspawn will happen...Award-winning Jeremy Strong has written many funny books for kids aged 7-teen, including My Dad's Got an Alligator and My Brother's Famous Bottom. Most of which are illustrated by Nick Sharratt, who also illustrates for Jacqueline Wilson! The Hundred-Mile-An-Hour Dog is back causing more chaos and getting into more trouble in Return of the Hundred-Mile-An-Hour Dog, Lost! The Hundred-Mile-An-Hour Dog, Wanted!The Hundred-Mile-An-Hour Dog, Christmas Chaos for the Hundred-Mile-An-Hour Dog and The Hundred-Mile-An-Hour Dog Goes for Gold - guaranteed to have you laughing your socks off!